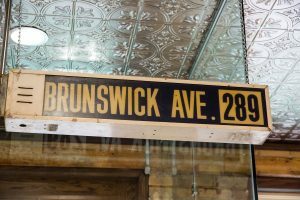 PHOTO BY GEREMY BORDONARO/GLEANER NEWS: Rexall Brunswick features many nods to history and community, such as this street sign. It was a grand opening for a grand old dame. 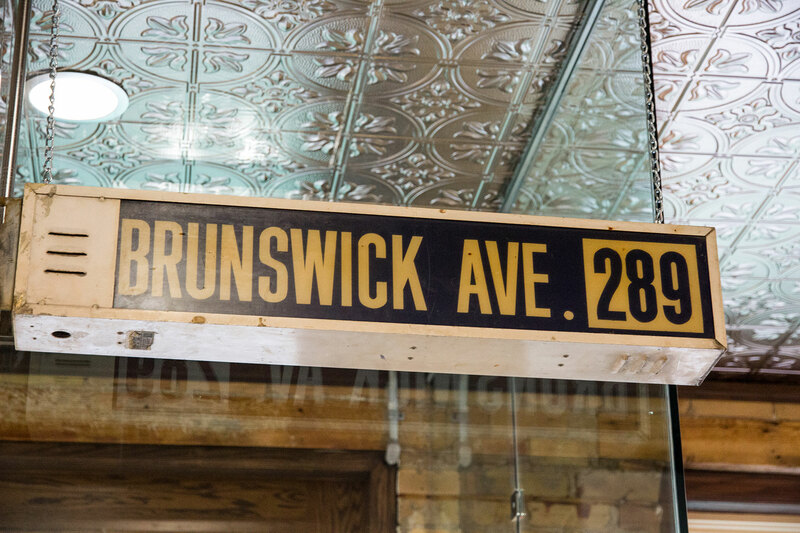 Approximately 45 community members, music aficionados, and company dignitaries celebrated the transformation of Brunswick House from a notorious student dive bar into a boutique flagship drugstore when Rexall/Pharma Plus officially opened Rexall Brunswick on Bloor Street West late last month. Great care has been taken in the restoration. The limestone walls have been polished, the exterior brick restored, and barrels that used to serve as seating and serving stations have been incorporated into the decor. The keg barrel bar is now the main checkout area. The splashy April 27 opening emphasized the building’s history as a live music venue, and featured radio broadcaster and music historian Alan Cross. He curated the Rexall Brunswick Music Artifacts Exhibition, featuring memorabilia from the artists who had performed there including Jeff Healey, Oscar Peterson, and Etta James. Representatives from each of the donated artifacts were also on hand to explain each item’s history. The exhibition will remain on display until May 11, after which it will become part of the Studio Bell’s permanent collection at the National Music Centre in Calgary. Gus Sinclair, chair of the Harbord Village Residents’ Association, said he’s pretty pleased with the restoration. For Joe Cressy (Ward 20, Trinity-Spadina), that aspect — heritage restoration — was the most important. The councillor added that Rexall was fully engaged with the city through the restoration process, and addressed long-standing issues with the site, like the placement of dumpsters. Cressy, Sinclair, and Burchell all agree that Rexall has taken great pains to integrate seamlessly into the fabric of Bloor Street. “It’s certainly consistent with what the city hopes to do with maintaining that scale along Bloor Street,” said Burchell. Sinclair pointed out that “the stable built form of the street is pretty much the same as it has been for one hundred years. “We’re very comfortable and very confident that we have lived up to our commitment to restoring the heritage elements and incorporating them into to the broader design of the store,” said Tupling. Correction: The photo credit in the print version made reference to a file photo. The picture was taken at the April 27 event.